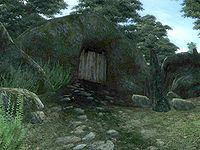 Darkfathom Cave is a small cave southeast of Leyawiin containing daedra (quest-related). It contains only one zone, Darkfathom Cave. This cave contains 2 Wisp Stalk plants. Once you've completed the Main Quest, this is a good place to find Daedra from which to harvest ingredients. The Daedra are spawned from standard leveled lists (e.g., LL1DaedricBeast100) which means that you will never encounter any Frost Atronachs or Dremora (outside of the quest). The Daedric inscription on both the altar and the two slabs flanking it reads "EVERLASTING LIFE". And, under the large O ('oht'), the word "NAMIRA" is inscribed. 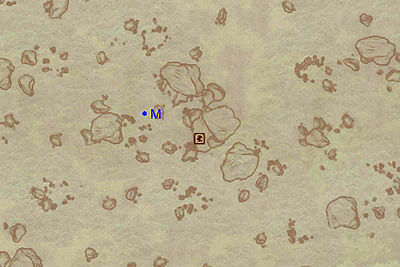 This location's map marker (M on map) is named Darkfathom Cave (editor name DarkfathomCaveMapMarker). The entrance door is ESE of the marker, 60 feet away. The shrine in Darkfathom Cave with the Staff of the Everscamp on the altar. 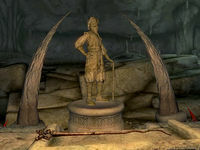 When you arrive in this cave you can choose between two paths, both leading to the heart of the cave and the shrine of Sheogorath; you can go left or right in the first hallway. 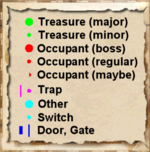 Both paths are guarded equally well and contain an equal amount of treasure. 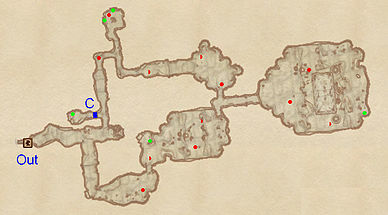 If you take the left path, the rock wall at C will lower down and you can reach an unguarded treasure chest. When you arrive at the shrine of Sheogorath, be careful because the daedra above the entrance can be alerted pretty easily. When you finally get rid of the Staff of the Everscamp you can take the other path to clear out the cave. Or, if you don't want to battle more Daedra, you can just backtrack to the cave entrance at Out.